Grace O'Malley (c. 1530 – c. 1603; also Gráinne O'Malley, Irish: Gráinne Ní Mháille) was lord of the Ó Máille dynasty in the west of Ireland, following in the footsteps of her father Eoghan Dubhdara Ó Máille. 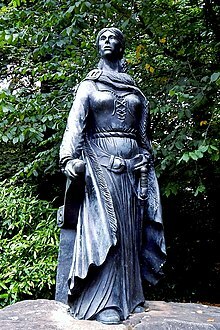 Commonly known as Gráinne Mhaol (anglicised as Granuaile) in Irish folklore, she is a well-known historical figure in 16th-century Irish history. Her name was rendered in contemporary English documents in various ways, including Gráinne O'Maly, Graney O'Mally, Granny ni Maille, Grany O'Mally, Grayn Ny Mayle, Grane ne Male, Grainy O'Maly, and Granee O'Maillie. All are versions of her actual name, Gráinne Ní Mháille. Upon her father's death she took over active leadership of the lordship by land and sea, despite having a brother, Dónal an Phíopa Ó Mháille. Marriage to Dónal an Chogaidh (Dónal "the warlike") Ó Flaithbheartaigh brought her greater wealth and influence, reportedly owning as much as 1,000 head of cattle and horses. In 1593, when her sons Tiobóid a Búrc (Tibbot Bourke) and Murchadh Ó Flaithbheartaigh (Murrough O'Flaherty), and her half-brother Dónal an Phíopa ("Dónal of the Pipes"), were taken captive by the English governor of Connacht, Sir Richard Bingham, O'Malley sailed to England to petition for their release. She formally presented her request to Queen Elizabeth I at her court in Greenwich Palace. Ní Mháille was born in Ireland around 1530, when Henry VIII was King of England and held the title Lord of Ireland. Under the policies of the English government at the time, the semi-autonomous Irish princes and lords were left mostly to their own devices. However, this was to change over the course of O'Malley's life as the Tudor conquest of Ireland gathered pace. Eoghan Dubhdara Ó Máille, her father, and his family were based in Clew Bay, County Mayo. He was lord of the Ó Máille dynasty and ruler of Umall, descended from Maille mac Conall. The Uí Mháille (O'Malleys) were one of the seafaring families of Connacht, and they built a row of castles facing the sea to protect their territory. They controlled most of what is now the barony of Murrisk in south-west County Mayo and recognised as their nominal overlords the Mac Uilliam Íochtair branch of the Bourkes, who controlled much of what is now County Mayo. The Bourkes (De Burca) were originally Anglo-Norman but by her lifetime completely Gaelicised. Her mother, Margaret or Maeve, was also a Ní Mháille. Although she was the only child of Dubhdara and his wife, O'Malley had a half-brother called Dónal na Píopa, the son of her father. With shore castles like Carrickkildavnet, the Uí Mháille taxed all those who fished off their coasts, which included fishermen from as far away as England. The head of the family (see Chiefs of the Name) was known simply by his surname as Ó Máille (anglicised as The O'Malley). Local folklore had it that Ní Mháille, as a young girl, wished to go on a trading expedition to Spain with her father. Upon being told she could not because her long hair would catch in the ship's ropes, she cut off most of her hair to embarrass her father into taking her. This earned her the nickname "Gráinne Mhaol" (Irish pronunciation: [ˈɡrɔːnʲə weil]; from maol meaning bald or having cropped hair), usually anglicised as Granuaile. The nickname may also come from "Gráinne Umhaill" ("Gráinne of Umhaill", Umhall being a historical district of west Connacht dominated by the Uí Mháille). As a child she most likely lived at her family's residence of Belclare and Clare Island, but she may have been fostered to another family, for fosterage was traditional among Irish nobility at the time. She was probably formally educated, since she is believed to have spoken in Latin with Queen Elizabeth I in 1593. Ní Mháille was married in 1546 to Dónal an Chogaidh Ó Flaithbheartaigh, tánaiste or heir to the Ó Flaithbheartaigh (O'Flaherty) title, which would have been a good political match for the daughter of the Ó Máille chieftain. As Ó Flaithbheartaigh tánaiste, Dónal an Chogaidh had expectations of one day ruling Iar Connacht, the area roughly equivalent to modern Connemara. Eoghan (Owen): The eldest child, known to be kind and forgiving. Sir Richard Bingham tricked him; Owen was murdered as a result, and Bingham and his troops took over his castle. Méadhbh (Maeve): Said to be much like her mother, she married Ricard Deamhan an Chorráin a Búrc, 'the Devil's Hook', with whom she had several children. Ní Mháille and a Búrc were supposedly very close, more than once saving her from death. Murchadh (Murrough): Murrough was said to take after his father, for he enjoyed warfare. He often beat his sister Maeve, and refused to listen to his mother because of her gender. Many sources report that he betrayed his family and joined forces with Sir Richard Bingham after the murder of Owen. When O'Malley heard of this she swore she would never speak to Murrough again for the rest of her life, though she would often insult him. After Dónal an Chogaidh's death, O'Malley left Iar Connacht and returned to Ó Mháille territory, taking with her many O'Flaherty followers. In 1565, Dónal was killed in an ambush while hunting in the hills surrounding Lough Corrib; this was, undoubtedly, part of Dónal's wider struggle with the Joyces for control of Hen's castle on the lough. Gráinne returned to her own lands and established her principal residence on Clare Island. She allegedly took a shipwrecked sailor as her lover. The affair only lasted briefly as he was killed by the MacMahons of Ballyvoy. Seeking vengeance, Gráinne attacked the MacMahon castle of Doona in Blacksod Bay and killed her lover's murderers on Cahir Island. Her attack on Doona Castle earned her the nickname 'Dark Lady of Doona'. By 1566, Ní Mháille had married a second time, this time to Risdeárd an Iarainn ("Iron Richard") Bourke, his nickname deriving from his ironworks at Burrishoole, the place of his principal castle and residence. The 1st Viscount Mayo was a child of this marriage. Still not satisfied with her revenge, Ní Mháille then sailed for Ballycroy and attacked the garrison at Doona Castle, overpowering the defenders and taking the castle for herself. Her attack against the MacMahons was not the first time she interrupted someone at their prayers. Legend tells of another lord who stole property from her and fled to a church for sanctuary. She was determined to wait out the thief, maintaining that he could starve or surrender. The thief dug a tunnel and escaped, however, and the hermit who took care of the church broke his vow of silence to scold her for attempting to harm someone who had sought sanctuary. Her reply is not recorded. More than twenty years after her death, an English Lord Deputy of Ireland recalled her ability as a leader of fighting men, noting the fame she still had among the Irish people. In 1593, in his letter to protesting Ní Mháille's claims against him, Sir Richard Bingham claimed that she was "nurse to all rebellions in the province for this forty years". Bingham was Lord President of Connacht, with the task of controlling local lords who had, until then, been effectively self-governing. Ní Mháille had every reason, and used every opportunity, to limit the power of the Kingdom of Ireland over her part of the country. Her castle at Clare Island was attacked by an expedition from Galway led by Sheriff William Óge Martyn in March 1579. However, they were put to flight and barely escaped. In the later 16th-century, English power steadily increased in Ireland and Ní Mháille's power was steadily encroached upon. Finally in 1593, when her family (her two sons Tibbot Burke and Murrough O'Flaherty, and her half-brother Dónal na Píopa) were taken captive by the English governor of Connacht, Sir Richard Bingham, Ní Mháille sailed to England to petition Queen Elizabeth I for their release. Elizabeth I famously sent Ní Mháille a list of questions, which were answered and returned to Elizabeth. Ní Mháille then met with the Queen at Greenwich Palace, wearing a fine gown, the two of them were surrounded by guards and the members of Elizabeth's royal Court. Ní Mháille refused to bow before Elizabeth because she didn't recognise her as the "Queen of Ireland." Its also rumoured that she had a dagger concealed about her person, which guards found upon searching her. Elizabeth's courtiers were said to be very upset and worried, but Ní Mháille informed the Queen that she carried it for her own safety. Elizabeth accepted this and seemed untroubled. Some also reported that Ní Mháille had sneezed and was given a lace-edged handkerchief from a noblewoman. She apparently blew her nose into it and then threw the cloth into a nearby fireplace, much to the shock of the court. Ní Mháille informed everyone that in Ireland, a used handkerchief was considered dirty and was properly destroyed. Their discussion was carried out in Latin, as Ní Mháille spoke no English and Queen Elizabeth I spoke no Irish. After much talk, the two women came to an agreement. Included in the stipulations for each party were that: Elizabeth was to remove Bingham from his position in Ireland, and Ní Mháille was to stop supporting the Irish lords' rebellions. The meeting seemed to have done some good, for Richard Bingham was removed from service. However, several of O'Malley's other demands (including the return of the cattle and land that Bingham had stolen from her) remained unmet, and within a rather short period of time Queen Elizabeth I sent Bingham back into Ireland. Upon Bingham's return, Ní Mháille realised that the meeting with Elizabeth had been useless, and went back to supporting Irish insurgents during the Nine Years' War. She most likely died at Rockfleet Castle around 1603. The same year as Elizabeth's death, though the year and place of Ní Mháille's death are disputed. Her family's usual burial place was in Clare Island Abbey. Her biography has been written by historian Anne Chambers. Documentary evidence for Ní Mháille's life comes mostly from English sources, as she is not mentioned in the Irish annals. The O'Malley family "book", a collection of eulogistic bardic poetry and other material of the sort kept by aristocratic Gaelic households of the period, has not survived. There are no contemporary images of her. An important source of information is the eighteen "Articles of Interrogatory", questions put to her in writing on behalf of Elizabeth I. She is also mentioned in the English State Papers and in other documents of the kind, an example being a letter sent by the Lord Deputy, Sir Henry Sidney, to his son Phillip in 1577: "There came to mee a most famous femynyne sea captain called Grace Imallye, and offred her service unto me, wheresoever I woulde command her, with three gallyes and two hundred fightinge men ..."
Local traditions concerning her were collected by Irish scholar John O'Donovan in the 1830s and 1840s on behalf of the Ordnance Survey of Ireland. In a letter of 1838 he describes her as being "most vividly remembered by tradition and people were living in the last generation who conversed with people who knew her personally". Charles Cormick of Erris, now 74 years and six weeks old, saw and conversed with Elizabeth O'Donnell of Newtown within the Mullet, who died about 65 years ago who had seen and intimately known a Mr Walsh who remembered Gráinne. Walsh died at the age of 107 and his father was the same age as Gráinne. A story is recorded of Ní Mháille chiding her son Tíoboíd in the course of an attack on Kinturk Castle, when she thought he was shirking the battle: "An ag iarraidh dul i bhfolach ar mo thóin atá tú, an áit a dtáinig tú as?" ("Are you trying to hide in my arse, the place that you came out of?"). She is also recorded as saying, with regard to her followers, "go mb'fhearr léi lán loinge de chlann Chonraoi agus de chlann Mhic an Fhailí ná lán loinge d'ór" (that she would rather have a shipload of Conroys and MacAnallys than a shipload of gold). Westport House in County Mayo, Ireland, was the seat of the Browne dynasty, Marquesses of Sligo, direct descendants of Gráinne Ní Mháille. The current house was built close to the site of Cahernamart (Cathair na Mart - "fort of the slaughtered cows"), an O'Malley fort. The original house was built by Colonel John Browne, a Jacobite, who was at the Siege of Limerick (1650–51), and his wife Maude Bourke. Maude Bourke was Ní Mháille's great-great granddaughter. There is a bronze statue of O'Malley by the artist Michael Cooper – the brother-in-law of the 11th Marquess of Sligo – in the grounds of Westport House. Westport House also contains a comprehensive exhibition on the life of O'Malley compiled by author Anne Chambers, a leading authority on Granuaile. In 1985, the Irish composer and singer Shaun Davey composed a suite of music based on the life and times of O'Malley, Granuaile, published in 1986. The Indulgers' 2000 album In Like Flynn includes a song entitled "Granuaile", which is centred on the legend of O'Malley. Dead Can Dance's 2012 album Anastasis features a song titled Return of the She-King, which was inspired by O'Malley. The Irish musician Gavin Dunne (Miracle of Sound) released a song entitled "Gráinne Mhaol, Queen Of Pirates" on his album Metal Up. The play Bald Grace by Marki Shalloe debuted at Chicago's Stockyards Theatre in 2005, and was featured at Atlanta's Theatre Gael (America's oldest Irish-American theatre) in 2006. American actress Molly Lyons wrote and starred in a one-woman show titled A Most Notorious Woman, detailing the life of O'Malley. It has been produced internationally at theatres and festivals. The play Gráinne, by J.Costello, K. Doyle, L. Errity, and A.L. Mentxaka, of 2015, tells the story of Gráinne O'Malley in six snapshots. It was premiered by Born to Burn productions in Dublin in November 2015, with an all-woman cast playing three female roles and six male roles. The text of the play was published in a limited edition by artisan publishers Gur Cake Editions. James Joyce used the legend of Gráinne Ní Mháille ("her grace o'malice") and the Earl of Howth in chapter 1 of Finnegans Wake. Neal Stephenson makes extensive reference to her via written correspondence from one of the prominent characters throughout The Rise and Fall of D.O.D.O. (with Nicole Galland). At Westport House - see above. Since 1948, the Commissioners of Irish Lights have sailed three vessels named Granuaile. Their current sole light tender, commissioned in 2005, is the most modern serving the coast of the island of Ireland. ^ O'Dowd, Mary (2008). "O'Malley, Gráinne (fl. 1577–1597)". Oxford Dictionary of National Biography. ^ "Dictionary of Irish Biography - Cambridge University Press". dib.cambridge.org. Retrieved 8 March 2017. ^ See the supplement to Chambers, 2003. ^ a b Ordnance Survey Letters, Mayo, vol. II, cited in Chambers 2003, spelling modernised. ^ Hardiman, James (1831). Irish Minstrelsy; or Bardic Remains of Ireland, Volume 2. p. 140. ^ "Granuaile". Retrieved 31 May 2011. ^ "The Indulgers Music Page". The Indulgers. Archived from the original on 8 June 2008. Retrieved 18 August 2008. ^ Reesman. "Interview with Dead Can Dance". The Aquarian. The Aquarian. Retrieved 22 August 2012. ^ "Gráinne Mhaol, Queen Of Pirates, by Miracle Of Sound". Miracle Of Sound. Retrieved 1 April 2017. ^ "Current Events: The Marki Shalloe Theatre Festival, October 21 – November 5, 2006". Theatre Gael. Retrieved 8 April 2007. ^ Brantley, Ben (6 April 2007). "The Pirate Queen - Review - Theater". The New York Times. ISSN 0362-4331. Retrieved 22 February 2019. ^ See J. Costello, K. Doyle, L. Errity, and A.L. Mentxaka, 'Grainne: A Play'. Dublin: Gur Cake Editions, 2015. ^ "Ships in the Irish Lighthouse Service". Commissioners of Irish Lights. Archived from the original on 3 February 2007. Retrieved 10 February 2007. ^ "Ye Loyal Krewe of Grace O'Malley". sites.google.com. Retrieved 31 January 2011. Chambers, Anne. Granuaile: Ireland's pirate queen Grace O'Malley c. 1530–1603. Dublin: Wolfhound Press. ISBN 0-86327-913-9. Cook, Judith (2004). Pirate Queen, the life of Grace O'Malley 1530–1603. Cork: Mercier Press. ISBN 1-85635-443-1. Druett, Joan (2000). She Captains: Heroines and Hellions of the Sea. Simon & Schuster, Inc. ISBN 0684856905. O'Dowd, Mary (2008). "O'Malley, Gráinne (fl. 1577–1597)". Oxford Dictionary of National Biography. Schwind, Mona L. (1978). "Nurse to all rebellions: Grace O'Malley and sixteenth-century Connacht". Éire-Ireland. 13: 40–61.